These are the words of Nikolai Diligensky, one of the first children diagnosed with autism in the USSR. He’s now 41 years old. He’s standing in front of the computer, swaying backwards and forwards, shouting loudly and hitting the keyboard. If Dagilensky were to go into the local food shop, for instance, perhaps the politest adjective that would be used to refer to him is “deranged”. But watching the lines that appear on the computer screen he is hitting so hard, you get the feeling that the word “writer” would be a more apt description. A good writer, just not quite like the others. 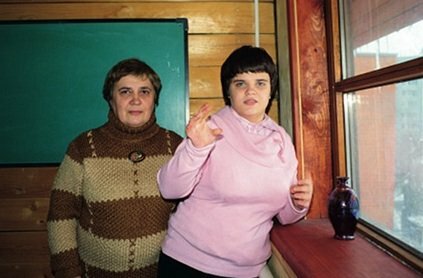 No one knows how many autistic people there are in Russia. There are no official statistics, but if there were it would hardly be an objective picture, because it’s a diagnosis people shy away from in institutions. Doctors often don’t have the qualifications to detect autism at an early stage, but even when all symptoms are present, many try to put something a bit more comprehensible, such as schizophrenia or mental retardation. On the ground floor of Moscow's Technological College no. 21 there are courses for drivers. On the first floor, young people with disabilities are taught to adapt to the outside world. The Centre for Training Young People with Disabilities has been in operation for 4 years and is a continuation of the workshops at CRE - the number of courses grew and the facilities were no longer fit for the purpose. After some years of appealing to the City Education Department, a meeting was set up and directors of all the Moscow Technical Colleges were invited. The only person who didn't just make empty promises was the director of College no. 21, Nikolai Razdobarov (and now other colleges are starting to follow suit). Currently there are 50 students in the college and half of them are autistic. The cost of running the college is partly funded by regular orders for corporate gifts, which are made by the students who receive a small sum for each object. "Autism is a mysterious phenomenon; you can't really call it a disease, it's more as though the personality develops along its own path, and very unequally. Completely healthy parents can have an autistic child, who by the age of 7, is doing mental arithmetic, multiplying triple figures, but doesn't know how to wash himself"
Autistic children's talents can develop very suddenly. A 10-year old boy, for instance, says he can hear beautiful music. He's shown a piano, sits down and plays a reasonably harmonious piece – without knowing a note, just from ear. Morgun remembers a 6-year old boy who knew which nurse would be on which shift, on a given day of the week, in 3 years' time. This child probably had Savant's syndrome. 10% of autistic children do; people with this diagnosis, as yet unrecognised, demonstrate phenomenal gifts in a particular area. These talents are usually to the detriment of other intellectual and emotional aspects of development. Raymond Babbit, the best known autistic person in the world, played by Dustin Hoffman in the film "Rain Man", was a savant, and his brother, Charlie, was quite like him in many ways. Passions for objects, in his case cars, are a fairly common sign of autism. Charlie can't be described as autistic, but his quasi-autistic characteristics make him a powerful teacher. He learns quite quickly to understand what it is that Raymond wants and helps him to become part of his surroundings. The film "Rain Man" shows how a non-autistic specialist can work successfully with autism. Lena realised that ordinary doctors would be no help to her son, Artyom, quite early on. Her local neurologist and speech therapist referred her to Moscow, where she and Artyom were to spend ten years in total. In Moscow, Artyom was seen by Anna Bitova, the future president of CRE, who diagnosed the 3-year old as suffering from "early infant autism". When CRE opened in 1989, Artyom was one of the first patients. I first met him and his mother two years ago at CRE's 20th anniversary concert. Artyom was giving a spirited rendering of Scott Joplin on the piano. "At one point he went wrong, but instead of starting again, he managed to carry on playing," said Lena. "That must have cost him a huge effort". Lena told me she had wanted to show Artyom "Rain Man". "He likes films, but quickly became very distressed, possibly recognising himself in the hero. He doesn't realise that he's different and his reaction was completely unexpected for me". When he was 12, Artyom had to leave CRE, and now he and his mother live in Tula. When she first went to see the neurologist there in 1990, he advised her not to tell anyone about Artyom's autism, as he was "the only one in the whole city". There are now 60 people registered with autism at the local alternative health centre, in a remedial education group, and even shoe shop assistants know the word. "Nikolai's parents were successful and well-off. They did all they could to pretend that nothing was wrong: it must have been very stressful for them when they had guests and Nikolai was running around the room next door and screaming." Tamara Eidelman has been a friend of Nikolai Diligensky's since childhood. She was scared of him when they were little: he was always twitching, his lack of physical coordination combined with total silence, except the odd howl, frightened her, but she didn't know what was wrong with him. Aleksey Adyrkhaev. Contrary to what she was told by Russian doctors, Lyosha's mother Larissa has managed to teach him to read, write and make his own bed using a system of cards. Thanks to his mum, Lyosha can now orientate in time and use public transport. When Nikolai was 15, he broke his leg. In hospital he was able to interact with people of his own age, which gave him enormous pleasure. Because of this, when he was well again, his parents arranged some history lessons for him. Tamara was the teacher, and there were 4 other boys of Nikolai's age. His normal method of communication was to trace letters on the back of his father's hand, so his father sat beside him for all the lessons and conveyed what his son wanted to say. Nikolai paid enormous attention to everything that was said; he later wrote in his memoirs that Tamara didn't condescend at all and taught them to think for themselves, rather than just passing on facts. Nikolai often managed to formulate a better and fuller answer than his classmates and realised that his theoretical intellect was no different from his friends', which helped him to understand his situation better. Nikolai's memoirs were published in 2000. In the years 1992-7 a specialist teacher asked Nikolai questions, which, again, he answered by tracing letters on his father's hand. The book is his attempt to understand himself. He writes, for instance, of how he once saw a picture of a woman walking along talking to herself. He was very struck, because he had always thought talking could only come from interaction with someone else. "It's like if the river didn't have two banks," he explains, "then there wouldn't be a bridge. That bridge is speech. I started to understand that my dumbness stems not from a fear of communication, but because I'm afraid I can't talk to anyone". Autistic people often have strange fears: the noise of the wind or the clouds scudding across the sky can instill terror. Larissa Adyrkhaeva is one of those mothers who experience all the fears with their children. When her 17-year old son Lyosha was 8, she decided he should learn about public transport. He screamed so loudly that passers-by were pulling her away from him, saying that she had obviously kidnapped him. Now Lyosha travels to the workshops at College no. 21 quite happily. "Larissa has managed to teach Lyosha to read, write and make his own bed. She used a system of cards: teeth-cleaning, for instance, was divided into 20 stages/cards, bed-making was only 5. She's been all round the local shops to explain that if a tall blonde boy comes to them with money and a card saying "bread", they shouldn't chase him away"
When Lyosha was diagnosed, he was 3, and the family was living in the USA. Larissa feels that the humane and efficient approach to his disability saved them. When he was 4, they returned to Moscow, where things were very different. Contrary to what she was told by Russian doctors, Larissa has managed to teach Lyosha to read, write and make his own bed. She used a system of cards: teeth-cleaning, for instance, was divided into 20 stages/cards, bed-making was only 5. After 18 months of training the card system disappeared for ever, as Lyosha had no more need of them. If you ask Larissa what would happen to Lyosha if anything were to happen to her, she starts crying. Her only hope, she says, is that they have a lot of relatives. She's been all round the local shops to explain that if a tall blonde boy comes to them with money and a card saying "bread", they shouldn't chase him away. Russia has few of the Western autism therapies, such as Applied Behavioural Analysis, or ABA. There simply aren't enough organisations or specialists (though, during its 20 years, CRE has helped some 10,000 children). Instead, autistic people usually have to cope with the medico-centric approach to illness in Russia. In the West 10% of autism is treated with medication; in Russia it's virtually 100%. Irina Karvasarskaya of St Petersburg's "Fathers and Children" tells the story of Vasya, a young autistic man who was studying in higher education. One day he lost his way and couldn't find the lecture hall. He ran to the office and, in great distress, started trying to explain what had happened. The people in the office were terrified and called an ambulance, which took him to a psychiatric hospital. His parents rushed there to get their son back, but were told he was danger to society and himself, so he'd have to stay there. By pulling strings they managed to get him finally to the Bekhterev Hospital, where they were told he had advanced schizophrenia and how come he'd never had any treatment. The parents managed to get a note from the doctor who'd been observing Vasya since he was 10: it said "Vasya G is not schizophrenic". Vasya and his mother. 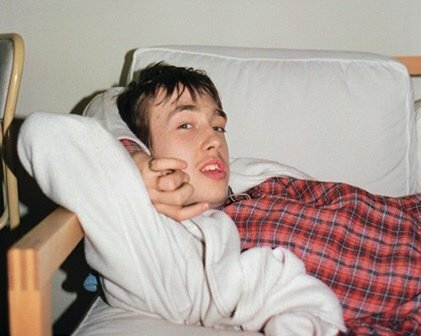 Vasya, now 20, was first diagnosed with autism at the age of 4. He speaks only when he really needs to and cannot engage in a normal conversation. In his college Vasya is considered to be a great weaver. His works are being sold at college fairs. The doctors in the Bekhterev listened to no one, declaring that they would cure him of his schizophrenia. He was given huge doses of a cocktail of drugs intravenously, but to no avail. They finally discharged him with a diagnosis of autism, but only after their professional pride was piqued. 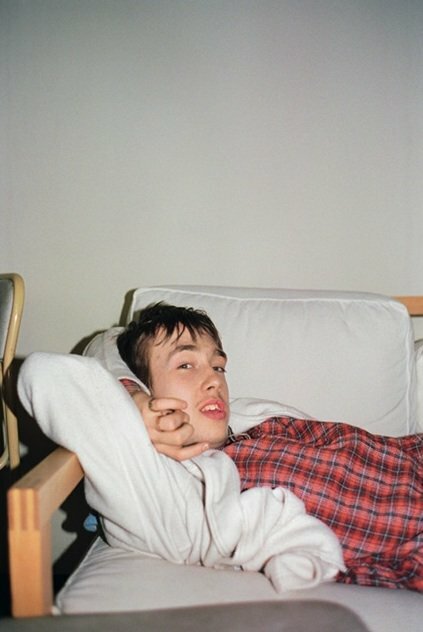 Vasya was in the hospitals for 3 months. Considering how much medication had been pumped into him, he should have been drooling, but he wasn't. He was a bit scared and had definitely understood what not to do if a similar situation should arise. Nikolai Diligensky had always worried about what would happen if his parents died. In 2002 they died within months of each other. Just as his father was being taken to hospital, he managed to ring Olga Konstantinovna, the widow of an old friend, and ask her to come and look after Nikolai. She treated his words as though they were his will. She needed professional help to get through the initial stages when Nikolai was trying to trace words on the back of her hand. 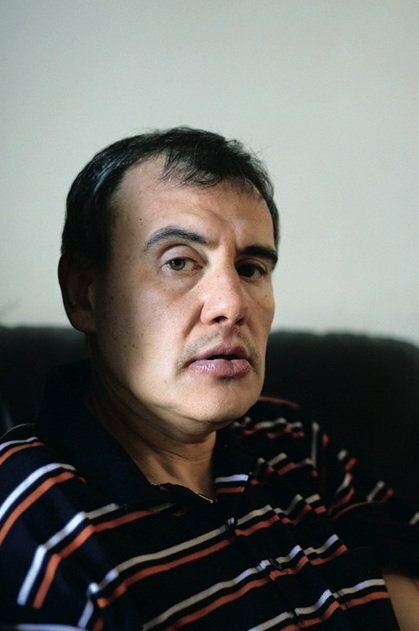 She was lucky to find Igor Kostin, from the Institute of Special Education, who set up a computer with an enormous keyboard in the sitting room of Nikolai's flat. Nikolai had been having computer lessons since the mid 90s; by 2002 it had become his chief means of communication with the outside world. His fingers sometimes would get stuck, so there were invariably more letters in the word than necessary, but the message was always clear. In 2004, Olga Konstantinova applied for a visa to go and live in Israel. She was trying to find a place for Nikolai to live: language was a problem, because he knew no Hebrew. Fortunately, she was told about a house for French speaking autistic people that was due to open soon. This was ideal because Nikolai's father had close links with France and had taught his son French. Nikolai had twice been to Paris with his father. The house is in a small town called Beit-Shemesh (Sun City), half-way between Jerusalem and Tel Aviv. It is run by Alex Aiis and has 25 inhabitants as well as the rabbits, guinea pigs and partridges they look after. There are Israelis, 5 French people, 3 Americans, some Spaniards, an Englishman, a Canadian and an Indian. Each person has a small room and access to the dining room at any time. There are no nurses; there is a doctor, but he lives off site, as does Alex Aiis himself. Aiis firmly believes that the only people who should be in the home all the time are the inhabitants. Many people were sceptical about his undertaking. The general view is that little progress can be expected from an autistic person after childhood, but Aaron, the only orthodox Jew in the community, is living proof of the opposite. When his parents brought him, he didn't speak. They left him there for two years with no home visits. Therapy taught Aaron to talk to his family and now he goes home for the Sabbath every week. The theory behind Beit Shemesh is that people with different needs live side by side: some are barely able to function, others appear not to need any help at all. Those with limited functionality work on site or nearby: they look after the grounds, work in the carpentry workshop or help with unloading lorries at local supermarkets. David, on the other hand, knows 8 languages and works in the Immigration Service, helping potential repatriates fill in forms; Isaac teaches English in the local school. Once a week the whole "kibbutz" goes on an excursion: perhaps to the desert, or to Eilat, where they might have a trip on a boat and go scrambling about the local caves. The more able take care of the less able and everyone has a good time. 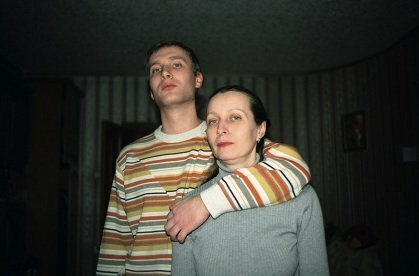 Artyom and his mother Elena. Artyom plays the piano 2 hours a week. His mother Elena believes that children with autism should be never left to themselves. No matter how difficult the child seems one should try to teach him everything possible, be it reading, counting, speaking, drawing, music or physical excercise. The monthly upkeep for each inhabitant of Beit Shemesh is $3,000, so the annual budget is nearly $1million. The Social Services Ministry provides 80% and the rest is made up with donations. Inspectors visit periodically: they see a normal house and normal people. Aiis believes that people should be helped whether they are gifted or not. Talent and intellect are not connected, he maintains if someone can tell you how many matches there would be in 500 boxes, but can't clean his teeth, where's the benefit in that? Russia has nothing like Beit Shemesh and most autistic people have little hope of being able to integrate into society, living with their families. The fate that awaits them is isolation. Roman Dimenshtein of CRE explains that, as there is no proper infrastructure, the government allocates up to $1000 per month for each autistic person in a home, but this is done through its own organisations and there's nothing for people living with their families. No one inside the system wants to see the funds go outside their control. "For so many years we were a society moving towards a higher ideal…socialism, communism and so on. Everyone is involved in this progress onwards and upwards, so when a family has a child that is different, it clearly can't be the fault of the society intent on higher things. It must be the fault of the family, but we are a humane society, so we give them a chance to put things right. The practice of removing children from their families is quite popular in Russia, so we take the child, hide it and then the government pays for its upkeep. So different from the humane system in the West. Some Russian parents are embarrassed by their child, so they keep them at home. It's a feeling that is stronger than they are,". Evgenia M was 30 when she put her child Artyom in a home. He was 5. She had a good job, which she loved, and was earning well. The family needed her salary. She looked for a home near her flat and found one quite close, which had good reports. But, as she says, a home is a home: they might not beat the children, but could well give them a cuff round the ear. Artyom is the only autistic child, the others are schizophrenics and oligophrenics, so he finds it difficult to communicate with them. His needs are not understood or, therefore, considered. But if he starts reacting to this with demonstrations of auto-agression, then he'll be tied to his bed… a chain of events that's terrible to think about. It's very dangerous to be a misfit in a home. Evgenia spent two years trudging round department after department, trying to get some form of individual teaching for Artyom. She did finally manage to get him two 20 minute sessions with a speech pathologist. Artyom comes home at the weekends and spends his holidays with his parents. One time when he came home for the weekend, she was told he had run around a lot the day before and was tired. He was behaving very strangely and it finally emerged that he had been injected with too big a dose of Neuleptil - it took him 2 days to recover. When Artyom reaches 18, she will either have to bring him home or leave him in a home forever. She has heard about the projected house for adult autistic people, which the Centre for Remedial Education is planning to build. The land was a gift, and there is an architectural design, but when the house will be built, no one knows. Every Friday Olga Konstantinovna takes Nikolai Diligensky home to her flat in Jerusalem. They watch a Russian film, drink tea and eat chocolate. Sometimes they go out for a walk. Twice a year they go on holiday – to Eilat or to Greece, for instance. Nikolai flatly refuses any offer to go back to Russia on a visit. When we start talking about his last years in Russia, he goes to his room. Olga is quite relaxed about Nikolai's father's night telephone call, though it changed her life. She didn't marry again, though she could have done, and she had to leave her job in the Russian State Humanitarian University publishing house. She also had to accept that not all her friends approved of her decision. Nikolai is clearly very fond of her. Sometimes he comes up to her and kisses the back of her neck. She says she has only recently realised that there is no one more devoted and loving in her life. - You don't regret leaving Moscow? - Would you like to go back? - Would you like to write another book? - What have you learnt since you've been here? - I've realised that everyone's different. There will be hundreds more studies, which attempt to explain autism. A lot of water will have to run under the bridge before people in Russia start treating people with autism as people. Until that happens, everything we find out about them will come from them themselves, as we did with Nikolai Diligensky. For him, ordinary human kindness has meant he can live in two worlds.